Some of the biggest scorers in Fantasy Basketball are Forwards. Although the guards are definitely worth investing in when making a DFS lineup at DraftKings or FanDuel, when you have guys like Lebron or KD you can always expect some high salary cap prices next to their name. The list below of Top 10 NBA Forwards for 2016/2017 are guys that you need to at least look at trying to fit into your lineups and then evaluate based on matchups and cost which one(s) are the forwards that will be the pick that will win you the most money. In a GPP (guaranteed prize pool) you may look more for lower cost sleeper picks for a forward position but if you are playing in a cash game either head-to-head or a 50/50 type of league you want to focus more on guys on our Top 10 NBA Forwards list. 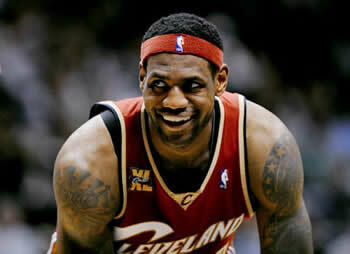 He is LeBron and he is one of the 5 best players in the NBA and some would argue THE BEST. As a fantasy basketball player he has his nights that he takes over the game and just tries to win it on his own, then he has nights that he defers to Irving and Love and takes more of a management role in the lineup. Regardless, always a great source of points. Will probably see a drop in his overall numbers as he joins a Warriors team that is stacked with scorers already. He is still worth a DraftKings fantasy pick but you may have nights that you see him be the 4th option and not the 1st in Golden State. Davis when healthy has the ability to be the best NBA Forward each night he plays. Unfortunately injuries are what usually slow him down. Thankfully playing DFS you only have to worry how he’ll play on the night you will pick him and not his long term health. Usually pays off big time when he is picked. Took a big jump in his scoring last year and may do so again with the departure of Tim Duncan. Has a great all-around game so fantasy points at FanDuel come from all over for Leonard. Another all-around forward that can score, rebound, shoot 3’s, steal the ball and drop a few assists too. After the playoffs last year George may be on a mission in 2017 to be a bigger name in the NBA than he already is. His numbers only keep improving and he may end up playing games as a point guard in 2017 too which could mean nights where his assists go up higher to go along with all the other fantasy numbers. Millsap is not a flashy player but he fills up the stat sheet overall. He is probably the best player on the Atlanta Hawks and should maybe even see an increase in his numbers for the 2016/2017 season. In DFS lineups he is usually a lower cost compared to the others on this List of Top 10 NBA Forwards but that makes him a better value pick. As always, finding a way of keeping Blake Griffin healthy is what season long fantasy basketball players need to worry about. For you, if Blake Griffin is playing, he is worth a pick with how his overall fantasy stats turn out every night he plays. The Knicks have loaded up with talent for this season and as good as the supporting cast is you can be sure that ‘Melo will still get his numbers. Anthony can be a selfish player at times which although bad for the Knicks is great on the nights he’s in your DFS lineup. The Spurs are now arguably Kawhi Leonard’s team but Aldridge will on certain nights have something to say about that. He is still a force in the paint and is always worth a look for your forward position.